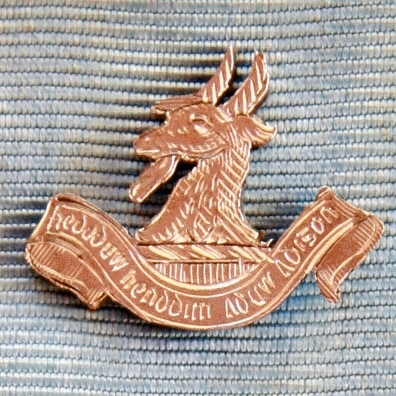 Silver Past Master's Jewel suspended from a sky blue ribbon by two "ribbon" silver bars. 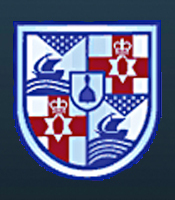 Centred on the ribbon is a crest depicting a goat. The top and bottom bars have the name and number of the Lodge "J. Creed Meredith Masonic Lodge No. 253". Short History of Warrant No. 253. Warrant No. 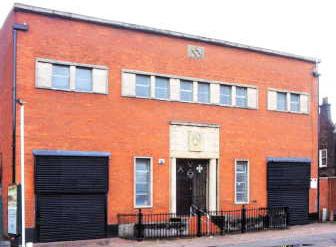 253 issued to the Brethren of “True Blue Lodge” in CARRICKFERGUS, Co. Antrim, on the 10th February 1755 and Warrant No. 253 was suspended on 2nd June, 1892. History of J. Creed Meredith Lodge no. 253, 1898 - to date. "31 May, 1898 - Read Memorial from Bros. Pink, Edgar, Baxter and five others praying for a Warrant to establish a Lodge in Belfast to be called the "J. Creed Meredith." Recommended by Lodges 156, 21, 664 and the P.D.G. Master of Antrim. Regular fee enclosed. The Board recommended the issue of a Warrant to the applicants to be numbered 253." The Grand Lodge Minutes of 2nd June, 1898 show that the Recommendation of The Board was followed and is noted as - "Confirmed"
Warrant No. 253 reissued to "J. Creed Meredith" Lodge in CRUMLIN ROAD, BELFAST, on the 6th June, 1898. The Lodge was named in memory of Sir James Creed Meredith, Deputy Grand Master 1898 to 1911. Series three Vol. 8 of the extant Grand Lodge Registers shows Samuel J. Pink (21); William H. Edgar (114) and Harvey Baxter (64) registered along with five others from various lodges, 6th June, 1898. No indication as to Master or Wardens. On the 29th June, 1898 a further thirteen brethren affiliated to J. Creed Meredith Lodge No. 253 six being from Lodge No. 132. A total of 57 brethren registered up to 29th August, 1900. In most cases the dates when the degrees were conferred and the issue of certificates is shown. Series four Vol. 14 of the extant Grand Lodge Registers shows a list of 35 brethren clearly transcribed, including their occupations, from the previous volume and a total of 212 brethren registered up to 19th April, 1923. In most cases the dates when the issue of certificates is shown, together with the occupation of the brother. Seven members 0f J. Creed Meredith Lodge No. 253 served in the 1914 -18 War and all returned. Series five Vol. 18 shown as Vol. 2 of the extant Grand Lodge Registers commences with the registration of James Hannas, Grocer, registered 17th April, 1924. Series six Vol. 21 of the extant Grand Lodge Registers commences with the registration on affiliation of W. J. S., Fitter (669) registered here 21st February, 1952. A total of 115 brethren registered up to 21st October, 1952. In most cases the dates when the issue of certificates is shown, together with the occupation of the brother. A total of 113 brethren registered up to 16th February, 1984. In most cases the dates when the issue of certificates is shown, together with the occupation of the brother. From 1984 the registration of members of J. Creed Meredith Lodge No. 253 is held, in alphabetical order, in a computerised register by Grand Lodge, Freemasons’ Hall, 17 Molesworth Street, Dublin 2. The Registration of the Worshipful Master, Wardens and Secretary of Lodges are held in separate Registers, the first Volume covering the period 1983 to 1994 inclusive and the second Volume covering from 1995 to date. Details of when J. Creed Meredith Lodge No. 253 meets. J. Creed Meredith Lodge No. 253 meets on the 3rd Thurs. at 7.15p.m. (Except 7 & 8) at Freemasons’ Hall, 91 Crumlin Road, Belfast BT14 6AH, County Down.